The house was rocking in Omaha. T.D. Ameritrade Park was filled to capacity and then some. The announcers on ESPN noted that every seat was filled and the standing room crowd was elbow to elbow. And why wouldn’t they be? Monday night was a heavyweight showdown between two of the best programs in college baseball and the two hottest clubs heading into this year’s College World Series. The #4 LSU Tigers (49-17) entered the contest on a 17-game win streak and having gone 22-2 in their last 24 games. In the other corner stood the #1 Oregon State Beavers, who entered the game sporting a hellacious 55-4 record on the season and riding a 22-game win streak. Omaha was buzzing and the world, at least the one that watches college baseball, was tuned in and at the ready. It all started with an innocent bunt by Oregon State’s speedy Steven Kwan that caught LSU on their heels. Two batters later, Trevor Larnach would drive in Kwan for the 1-0 lead. Unbelievably, in retrospect, the game seemed over at that point as LSU would never threaten. OSU’s starting pitcher, Bryce Fehmel, would go eight innings, only striking out three but absolutely decimating the Tigers’ lineup on a baffling night that would see LSU only put up four hits (and two of those were in garbage time). It never felt like LSU was in this one. After the Beavers put up one run in the first, Kramer Robertson seemed like he was going to jumpstart the Tigers by rocketing a hit up the middle, but that would-be single rocketed into Fehmel’s shoe for an easy putout at first. The next inning it was Greg Deichmann drilling a pitch into right-center field but that was tracked down just as easily. After a Zach Watson single, the Beavers’ catcher had Watson dead to rights at second base, but Watson somehow beat the throw, and was incorrectly called out. The next inning would see LSU’s starting pitcher Eric Walker, who was looking good, leave the game with forearm tightness and, even though they were only trailing 1-0, it felt like LSU would have a mountain to climb if they wanted to knock off the Beavers. Mountains are big and some of them are just too much. This one would be no different, as the Beavers poked and prodded their way out to a 4-0 lead making a few LSU pitchers look bad along the way. By the time Hunter Newman entered the game the wheels were very wobbly on LSU train. Five pitches later the wheels were completely off as Newman served up a walk to Larnach and then a grand slam to K.J. Harrison to effectively end any talk of comebacks as the Beavers romped to an 8-0 lead in the sixth inning. To be honest, just from the feel of the night, it could’ve been worse. And it did get worse as the Beavers weren’t done, tacking on five more runs in the final stanza to absolutely pummel the Tigers with a 13-1 beat down. That 17-game win streak seemed like a distant memory by the end of the game as the Tigers watched the Beavers, who have been #1 all year long, waltz away into the winner’s bracket. LSU now has to take the long road to get a crack at the finals. 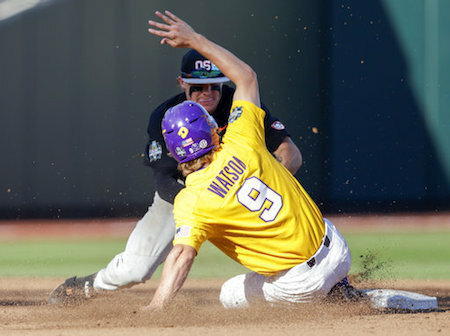 LSU, with Jared Poche on the mound, will have to knock out the Florida State Seminoles in an elimination game on June 21, 6 p.m. to get another shot at Oregon State, who the Tigers will have to beat twice to advance. To put it another way, they will have to beat the team that has only lost four times the entire season twice in two days. Yowza. That’s no mole hill, folks. Things are tough in New Orleans as well. A sigh of dismay blew down Bourbon Street, momentarily making everyone forget its horrific smell, as WhoDat Nation learned that the Saints starting left tackle, and best lineman overall, Terron Armstead suffered a torn labrum that will keep Armstead out four to six months. Armstead only appeared in seven games last year. The news, coupled with center Max Unger’s foot injury, has the front line protecting Drew Brees on shaky ground. These injuries will bring the play of former first round pick Andrus Peat back into focus and put pressure on this year’s first round pick Ryan Ramczyk to get onto the field much sooner than expected.